George Edwin Farrar had lost his father five days before Christmas 1945. He wanted to remain in Atlanta with family, but his job at Neumann, Buslee, and Wolfe meant that he must return to Chicago. He wrote a letter to his mother shortly after his return. 224 – 230 W. Huron St., Chicago, Ill.
Have intended writing every day since my arrival, but some-thing is all-ways in the way when the opportunity is present. Had a very nice trip up, even though I did stay up all night. Will be staying around Chicago until the last of the month, when we will leave for Texas. I wanted to get a place close in town, but the Buslee’s just wouldn’t let me so guess I’ll stay here with them. Guess by now Carroll is getting up bright and early in the morning, and going to work. I have been getting up around seven thirty in the mornings my-self. We all-ways take about one and a half hours for lunch, and leave the office at four. Tell Carroll not to work too hard. Mr. Henson is in Chicago, but he didn’t bring Jeanne with him. She is coming this summer. Mrs. Henson has been sick for a little over a week. Hope Gene is taking full advantage of his Y.M.C.A. card. It will do him more good than any-thing in the world. Am sure Carroll and Millie will take him down and show him where the place is. Can’t think of more to write about, except I want to hear in my next letter from you, that you have seen the doctor, and I don’t mean for you to stop writing. Carroll was Ed’s older brother by five years. Millie was Carroll’s wife. They married February 26, 1944. Mr. Henson was the father of William Alvin Henson II, the navigator of the Buslee crew. Jeanne was William’s sister. Gene was Ed’s youngest brother. On November 7, 1944, Franklin D. Roosevelt was elected President of the United States, an unprecedented fourth term in office. Two days later, on November 9, and far away from home and family in the states, George Edwin Farrar was still a patient in the hospital of Stalag Luft IV, a subsidiary camp of Stalag Luft III. It was now forty-two days after the mid-air collision between the Lead Banana and Lazy Daisy. 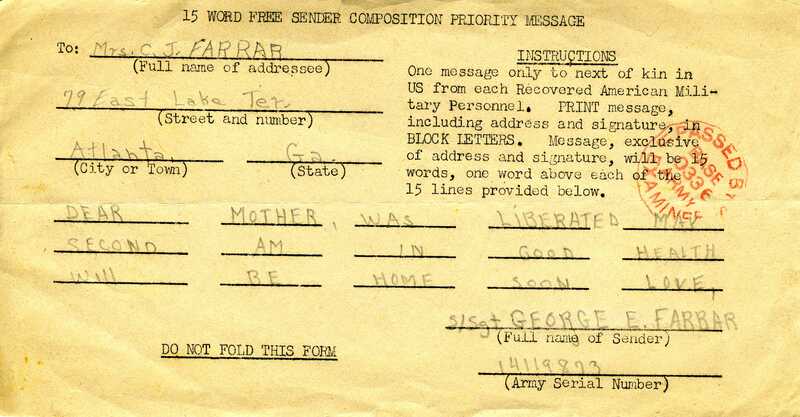 This day, Farrar wrote his second letter home. This letter was postmarked January 17, 1945, and was marked with the date when the Farrar family in Atlanta, Georgia received it – March 23, 1945. Farrar must have worked very hard to regain his ability to walk. He could not have known at the time that in a few months he and all the other prisoners at Stalag Luft IV would be forced to march out of the camp and begin an 86-day journey across Germany to their final liberation on May 2, 1945. By the time of the Farrar family’s receipt of this letter on March 23, George Edwin Farrar had been marching for forty-five days. He was not, as it seemed from his letter, sitting in a German prison camp and “feeling fine.” He was tired and hungry to the point of starving. This letter also indicates that by November 9, he had been told that he was the only survivor on the Lead Banana.